Writing Up the Ancestors: Where did your ancestors live in Montreal? Where did your ancestors live in Montreal? I am often curious to find out where my ancestors lived at different times of their lives. For most of my 19th and 20th-century Montreal ancestors, this has been relatively easy using online maps and city directories, and I have used the same techniques to find ancestors in Philadelphia, Winnipeg, and other cities. Once I locate them, it is fun to look at the same addresses today using Google Street View. In Montreal, the main directory has been published by Lovells since 1842, and these resources are searchable online on the Bibliothèque et Archives nationales du Québec (BAnQ) website. While the directories themselves are in English, this post should help you navigate that French-language provincial archives site. Go to http://bibnum2.banq.qc.ca/bna/lovell/index.html and, on the left, click on explore. Then click on Montreal et sa banlieue (Montreal and its suburbs), then on serie principale (1842-1977) and choose the year you want to explore. You can search for either the name of the household head or for the street address. This directory often includes the occupation and/or employer of the household head. 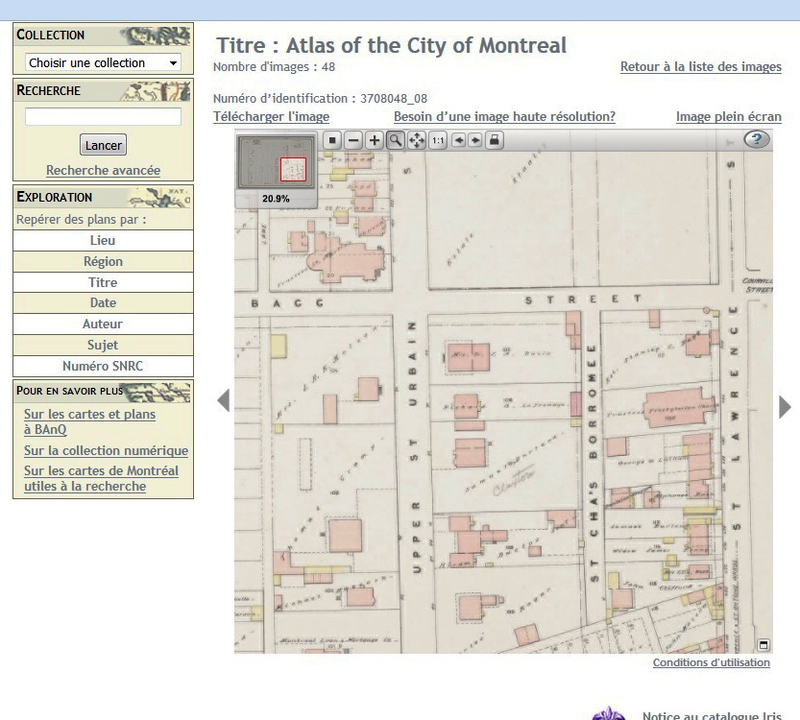 A sample map of Montreal showing a corner of my ancestor's property on the BAnQ site. Once you find your ancestor’s home address you can try to find it on a map of the city during the same time period. The page http://services.banq.qc.ca/sdx/cep/accueil.xsp will take you to the BAnQ’s collection of digitized cartes et plans, or maps and diagrams. 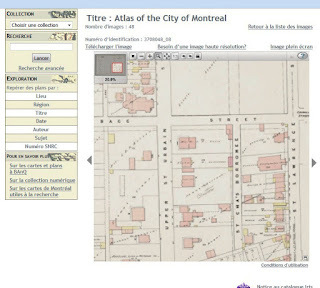 You can search by lieu (place), by region of Quebec or Canada, or by title of the map, date, author or subject. If you are looking for the easiest maps of Montreal to understand, go to the left hand side of that opening page and click on the bottom choice of Collections, Pour en savoir plus, “Sur les cartes de Montreal utiles à la recherché” (to learn more about easy-to-use maps of Montreal). This will take you to a list of useful maps of the city, such as Goad’s maps, which were created for insurance purposes and identify property owners. Searching for property ownership documents is a whole other complicated story I’m not going to talk about here, except to say that these documents can be found -- with a lot of effort. Go to https://www.mern.gouv.qc.ca/english/land/register/index.jsp, a site of the provincial department of Énergie et Ressources naturelles Québec, and follow the links to the Land Register of Quebec site. First, though, you need to know the ward of the city your ancestors lived in, and the cadastral number of the property they owned, which is not the same thing as the street address. You may have to compare different maps of the same area over different time periods to nail this down, remembering that street names and numbers sometimes changed. Once you have a firm idea of your ancestor’s geographic location, the 1874 map titled Cadastral plans, City of Montreal (http://services.banq.qc.ca/sdx/cep/document.xsp?id=0000337579) can help you to identify the cadastral number. Once you see the image of the map you want, you can click above it on the left to download it (télécharger l’image) or on the right for a full-screen view (image plein écran). Move the red rectangle in the small map at the upper right to navigate your way around the screen.